THE past 12 months has been one of impressive recruitment, progress and development for girls football at Brighouse Juniors FC. Almost 70 girls have now signed on at the club forming teams at Under-11,13 and 16s. The Under-11s started their journey in the summer. Player interest was such that two teams were quickly formed and they attracted sponsorship from the Far East through former local sports journalist Jeremy Walker. Jeremy was brought up in Brighouse and heard about Brighouse Juniors through Facebook. He was keen to support his local club and was quick to sponsor the Under-11s new kit. While living in Brighouse, he played football locally before moving away to continue his career as a sports journalist. He started his career working for the Halifax Evening Courier, Huddersfield Examiner and Northern Echo, covering Newcastle Utd FC on a daily basis with Gazza at his peak. He then moved to Hong Kong in 1989 and worked for seven years there followed by 13 in Japan, as a chief sports writer. During this time he became good friends with Arsenal manager Arsene Wenger. He has now lived for three years on mainland China and for three years in Macau and continues to work in sports media. He is currently the editor of the Olympic Council of Asia. Halfway though the season and the Under-11s are playing great football and enjoying several functions, including an up and coming visit to Huddersfield Town to do a guard of honour . The Under-13s are competing in their second season with great success. The youngsters have played eight games in the league so far, winning all of them. Rims and Trims jointly sponsor the Under-13s and |Under-16s with Park Row Hair and Beauty. 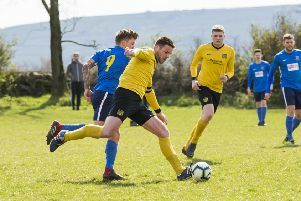 The Brighouse-based businesses have supported the club set-up for the last two years and remain dedicated and pro-active in the development of the teams at Brighouse Juniors. The Under-16s had a hugely successfully year in 2015, finishing fourth in the league and winning the League Shield. The team currently boast 18 players in their squad, all of who have shown an impressive amount of focus and commitment to develop into quality footballers. The year ended on a high as they locked horns with previously unbeaten Castleford. Having lost to the league’s high fliers 11-0 last year, the task in hand was a tall order. Goals from Tiegan Rowley, Jordyn Chasiak-Pratt, Emily Dooley and a last minute strike from Niamh Davis saw the Broad Oak-based team run out 4-3 victors in a exciting encounter. Team spirit is at an all time high as the girls enter the second half of the season. Plans are already in place to progress though to Under-18s and ultimately become an open age team. With a great network of coaches, helpers, supporters and the correct philosophies for grassroots football Brighouse Juniors are in great hands and this year promises to be equally productive as the club look for ways to build on their recent progress. Any girls interested in playing football from ages six to 16 should contacy 07917 774673 to express interest.